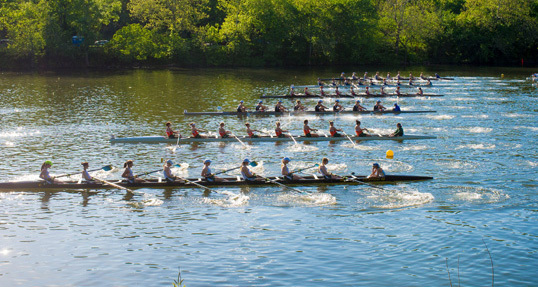 Schuylkill Navy continues with its commitment to support the rowing community in Philadelphia’s Boathouse Row, and to serve as the governing body on the Schuylkill River. Today, they are announcing the development of a best-practices Safety Campaign with apparel & accessories firm Scull & Sweep. Since its inception, the Scull & Sweep brand has been focused on developing high-visibility performance apparel to better serve the rowing community in helping to protect rowers and their equipment. The Schuylkill Navy / Scull & Sweep partnership will come to life this spring 2017 with a new collection of high-visibility apparel that will include jackets, vests, training tops and unisuits, and will be available online at www.scullandsweep.com as well as at Schuylkill Navy sanctioned regattas. “A key imperative of the Schuylkill Navy’s work is safety on the River. With the support and expertise of Scull & Sweep, we are taking another step in ensuring that all of our athletes are kept safe 365 days a year. Access to great high-visibility rowing apparel, as well as the safety expertise of the Scull & Sweep team, brings tremendous value and benefit to the rowing community in Philadelphia.” – Paul Horvat, Schuylkill Navy Commodore. “We are enthusiastic about the Schuylkill Navy / Scull & Sweep partnership. Boathouse Row and the Schuylkill Navy have long been an important part of rowing in the United States. It’s an honor for us to help with their safety mandate by providing high-quality, high-visibility performance apparel. Helping to keep rowers safe, and minimizing equipment damage, is a fundamental goal of both organizations. We look forward to working with the Schuylkill Navy in the years to come.” – Howard Winklevoss, Chairman, Scull & Sweep. About Scull & Sweep: Founded in a culture of craft and innovation, Scull & Sweep is passionate in its support of the rowing lifestyle and in advocating for the expansion of the sport of rowing. From it’s involvement and collaborations within the rowing community to serving rowers needs through product innovation, Scull & Sweep is dedicated to providing meaningful solutions that enable rowers to do what they love to do best, row.